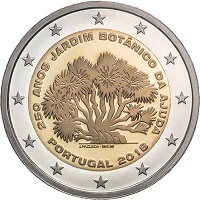 This coin commemorates the 250th anniversary of the founding of the Ajuda Botanical Gardens in Lisbon. After the devastating earthquake of 1755 in Lisbon,the royal court was moved to Ajuda, then a suburb of Lisbon. The king bought a plot in 1768 adjoining the palace which was to supply fruit and vegetables to the palace. An Italian naturalist, Vandelli planned the gardens which in effect became the first botanical garden in Portugal. The decoration is Baroque in style. The Ajuda Botanical Garden now has an area of 35,000 sq. metres and a height variance of around 6.8 metres. It has become a centre for the study of various botanical species from around the world. An interesting feature is a section of the park mainly for the enjoyment of blind people where the emphasis is on fragrant plants rather than optically pleasing plants. Within the inner circle is a bold depiction of a Canary Dragon Tree – the one shown was actually planted in 1760. Around the edge of the outer ring from eight to four o’clock is the inscription “250 ANOS JARDIM BOTĀNICO DA AJUDA” (250 years of the Botanical Gardens of Ajuda). Around the lower edge of the outer ring are the issuing country and the year of issue “PORTUGAL 20018”. Finally at the base of the tree are the name of the designer and the mint mark – “J.FAZENDA-INCM”.